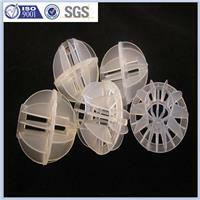 Plastic Polyhedral Hollow Ball has good absorption effect and high purifying efficiency. It is widely used in chemical industry. petroleum industry, chemical industry, alkalichloride industry, coal gas industry and environmental protection, etc. ●Other packing is available upon your request.